Optical Pattern Recognition: Risk Management in real time. Risk Management in real time. Optical Pattern Recognition at a Glance! 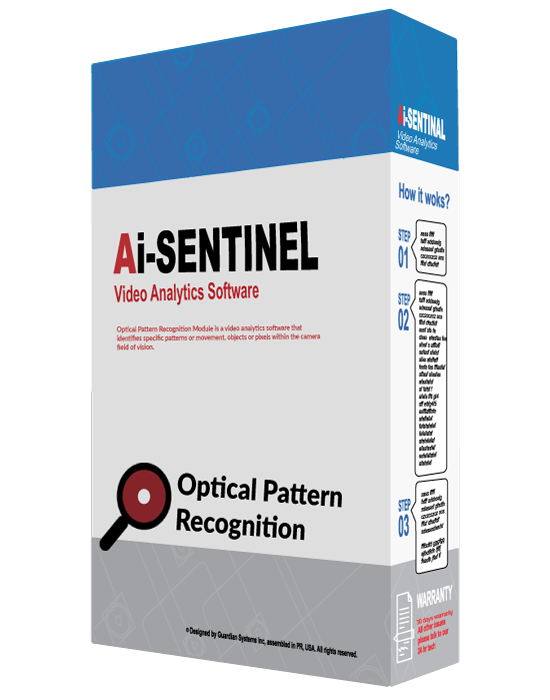 Optical Pattern Recognition Module is a video analytics software that identifies specific patterns or movement, objects or pixels within the camera field of vision. The artificial intelligence algorithm identifies the specific pattern in a set environment (“masking”). It identifies potential risks in advance, analyze them and take precautionary steps to reduce or eliminate the risk. It can identify required company uniforms, safety equipment, and more. A real guardian that can detect fights, slip and falls and other human behavior and notify the user in real time. Optical Pattern Recognition Module can be used with others modules at the same time. *Optical Pattern Recognition requires a 6-months software upgrade service. What is the Optical Patter Recognition Module? It’s an AI module that identifies pre-determined patterns in the field. If the User wants to know about any certain activity in their business, we can work to “mask” this patter, recognize it and alert the user. What can the Optical Pattern Recognition Module be used for? This module can be used for detecting slip and fall, loitering, fights, running, and more human activity. We can also configure it to detect certain compliance items like uniforms, safety equipment and more. Yes. All our platforms can be used in together to create the perfect system to the User. As an example, the Optical Pattern Recognition Module can be used with the People Counter or People Detection to know in real time if a slip and fall happens and emergency management is needed.